One rainy, cold October day I found myself with a jar leftover pumpkin puree and a hankering for some fresh baked cookies. 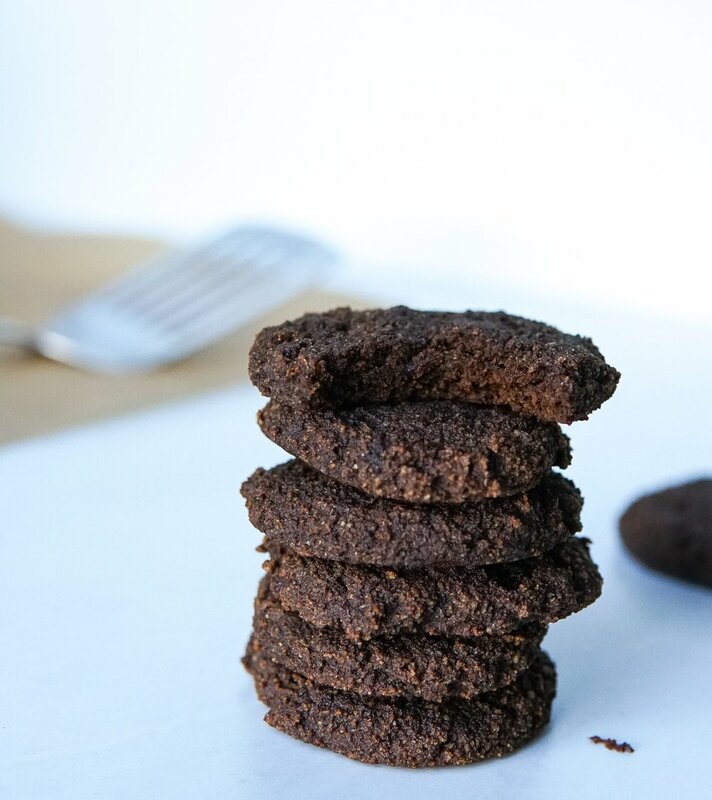 What cookie combo is more warming than rich molasses, spicy ginger and warming cinnamon? This recipe uses simple ingredients that you probably already have AND all you need is one bowl! You’d never guess that they’re gluten and dairy-free! The combination of pumpkin puree, almond meal and a touch of coconut oil makes these cookies super soft and moist. The molasses and coconut sugar add the perfect amount of sweetness to bring out the warming spices. Is molasses good for you? Yes! Molasses is one of my favorite sweeteners because of it’s earthy, sweet, robust flavor. I always opt for blackstrap molasses because it has a much higher concentration of minerals like iron, calcium and magnesium compared to light and dark molasses. It also has a much lower glycemic index than most sweeteners, so it doesn’t spike your blood sugar as much. How Do I Make Oat Flour? Easy! Just put some rolled oats in a blender or food processor and process until it turns into a fine flour. I like to make a big batch and keep it on hand in my pantry for baking. Can you substitute banana for pumpkin? Most recipes that call for pumpkin puree can be substituted with banana. Just keep in mind the banana will add more sweetness, so you might want to cut back on the sugar. What makes a soft cookie? In general, soft-baked cookies tend to have more moisture and are baked at a lower temperature. Most soft or chewy cookies use more brown sugar or molasses as a sweetener because it contains more water/moisture than cane sugar. Using ingredients like pumpkin or banana will make a cookie softer because it also adds a lot of moisture. In a large bowl, whisk together the pumpkin, molasses, coconut oil, vanilla and egg. Add the almond meal, oat flour, coconut sugar, cinnamon, ginger, cloves, baking soda and salt. Stir the batter until everything is thoroughly combined. Scoop the dough in heaping spoonfuls onto the baking sheet . Use your hands to flatten them out as best you can until about 1/4-inch thick. Bake 12-15 minutes or until the cookies feel slightly firm and the bottoms are golden. Allow to cool completely. Store in an airtight container in the fridge. Make sure you flatten the cookies to about 1/4 inch thick. It helps to use wet hands so the batter doesn’t stick to your fingers! Substitute banana for the pumpkin if you’ve gotten overripe bananas on hand. Nut allergy? Try substituting the almond flour with 1 cup oat flour and increasing the coconut oil to 3 tablespoons or more until the dough is moist enough. To make vegan, substitute one flax egg (1 tbsp ground flaxseed mixed with 3 tbsp water, let sit for 10 minutes). Store the cookies in an airtight container for up to 5 days or in the fridge for up to 10 days.